If you spend very much time with me, at some point you'll hear me confess "I'm kind of a hippie." But not the LSD and shower-avoiding hippie! I'm an LDS, shower-loving hippie. I believe in being a good steward over the earth and doing my best to be as sustainable as I can. It is easier to be green in Humboldt County than it is to be green in a suburban metro area, so sometimes I struggle with how not green my lifestyle is. But I've come to the point where I'm content to do what I'm able to do, and to save the big things (e.g. a grey water system, a compost heap, solar panels) for another season of my life. One of the ways I work towards sustainability is by using less than the "recommended" amount of products. Like dishwasher soap. You don't need to fill the whole soap compartment to get the dishes clean. And you can use less water to rinse them if you use less soap. I use green scrubbies to scrape our dishes before loading them in the dishwasher. But after a while the scrubbies get super gunky, especially if they've been used on the cast iron skillet, or the kitchen aid bowl after it has mixed bread dough. When they're super gross I throw them out (not green). But instead of using the whole big scrubbie as it comes from the manufacturer, I cut it into quarters and just use one quarter of the scrubbie at time. Cutting up the green scrubbie also saves me money. Instead of getting two scrubbies, I get eight! And instead of throwing away one giant scrubbie every couple of weeks, I'm only adding a big scrubbie's worth to the landfill every four to eight weeks. ... oh dear, when I say it like that is sounds like a lot. But it is less than it could be, and for now that is what I can do. Maybe, when I have a compost pile I can find scrubbies that are compostable! That would be great. 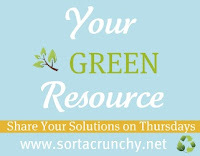 to find more great posts about sustainability and thriftiness. That's a good idea! I don't use these currently (we have a scrubby brush that is a favorite in our house), but I remember they did seem to get pretty gunky quickly, and I found myself always wanting to throw them away. And the original size is pretty big for your average-size hand, or at least it was for my hand. Very cool! Thanks for sharing!! I especially like to use them on pots and glass pyrex that were used for cooking or baking. And on the cast iron skillet. They're perfect for getting the baked on brown stuff off! I like the way "green scrubbie" sounds, and I love your blue tights and your daughter's pink tights. And you're nursing your 1 1/2 year old--that means you are a self-sacrificing woman! Thanks for the idea! I don't knit, but I do crochet and I've been thinking about these, but just haven't made the jump. My grandma makes crochetted cloths, but I don't use them very often because I can't bear to ruin them and throw them out. But maybe if I made them myself it wouldn't be so bad. I'm not ready to let go of the green scrubbies (the extra scratchy surface is useful sometimes) but I have tried using a washcloth instead of my usual dish sponge. That didn't last long because the washcloths were too big and got gross to fast (I don't have an in-home washer so running out of washcloths is a real possibility). I have a rinse-it-and-don't-leave-it-lying-in-the-sink rule for my sponges and scrubbies that reduces sliminess and nastiness. A nasty sponge promptly gets thrown away. But a little washcloth that could be washed is a better green option... you've got me thinking!